One thing that i did notice since i was landed in Munich May 24, 2011. How people in here so care about disabled person. People with special requirements, in wheel chair, or can't see... its amazing the level of caring that i can not stop feeling sad!! And for those with all special needs, there are NO limitation for them to do activities like other people! go to school, doing sports, swim, going to cafe, had lunch in park, sun bathing.... no limitation!! they could mobile as easy as they could.. i feel so envy! They build special ramp every where so it could easily accessible for wheel chair, start from castles, bus stop, tram, and trains! 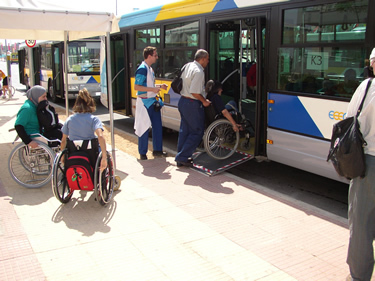 At cities, they build the side walk also accessible very easily for the disabled person. Even for city that had cobbled street like in Strasbourg or in Brussels, i could see many senior citizen with their electric/mobility scooter doing things like normal. Seeing friends, buy groceries. My great great grandmother who live in mountains in Sumatra never see this for sure. Chance for senior people to do their activity like normal and not to depends to anyone! This is also the very first time i see someone... who doesn't have legs to drive by him self (in Brussels) its amazed me! Special kids with down syndromes wont go by them self in Indonesia, people will stare look down, others kids will laugh at them and oh my God... in Germany they could do high five on their wheelchairs and say see you again, and laugh and cross the street WITHOUT ANY HELP!! and no one will disturb them! !